Squad rotation is a reality that modern football has become well acquainted with. To most counties, their meagre playing resources make that notion an unimaginable luxury. Surrey are different. On a day limited to 17 deliveries - Surrey's quest for a second Championship win since September 2012 will resume on Wednesday - they provided another reminder of their financial strength by signing Ireland's Kevin O'Brien. 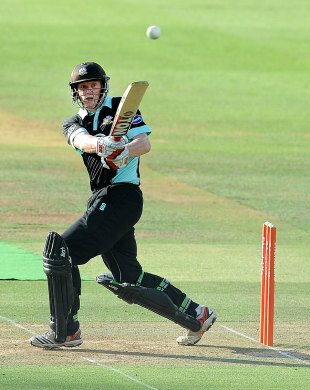 It adds lustre to their Twenty20 batting line-up ahead of their tournament opener at Hove on Friday night. But it is in pace bowling that Surrey's resources are most plentiful and where resting players is a luxury they can afford. While Tom Curran, Matt Dunn, Tim Linley and Chris Tremlett illustrated their contrasting qualities to take 20 Gloucestershire wickets for only 398 in this game, Jade Dernbach and Stuart Meaker were rested with the NatWest Blast in mind. Add in George Edwards and Surrey, for all their plight near the foot of Division Two in the Championship, have seven pace bowlers with strong claims. The club's approach to managing these talents evokes Claudio "The Tinkerman" Ranieri's selection policy at Chelsea a decade ago. "You generally try and get your quick bowlers to play between ten and twelve games each, so that when they play they're fresh and when they're just lagging a bit you can leave them out and someone else can come in fresh," Surrey's director of cricket - and Chelsea fan - Alec Stewart explained after the first day. "That's how we try and do it with the bowling resources." Tremlett is among those who should benefit. "That's the joy of having a big squad," he said. "I don't want to put my body under too much stress." In other positions, the need for rotation is less pressing. Behind the stumps, Gary Wilson, who has deposed Niall O'Brien as Ireland wicketkeeper, will be in no mood to relinquish the responsibilities that he has gained while Steven Davies works on his batting. Stewart warned Davies that, "No one has a divine right to say 'I'm a keeper therefore I keep'. It's how the selectors feel." Wilson strengthened his case with impressive keeping in both innings against Gloucestershire, which was not reflected in a match total of 25 byes. With rain dominating the day, Wilson had the chance to welcome his compatriot Kevin O'Brien. In the spirit of the age, he tweeted a selfie, though one imagines that it resonated rather less far than David Cameron's attempt at Nelson Mandela's funeral last year. O'Brien is expected to be available for nine games before he heads to the Caribbean: such is the life of the nomadic cricketer. The lack of regular team-mates is "probably one of the hardest things to get used to" but O'Brien said that it was "easier when you come back and you know the guys in the changing room". He made a big impression in very little time last season, relishing the short boundaries to the Mound and Tavern stands in scything a 24-ball 54 at Lord's. That innings was from No. 4, though it is opening - as when smiting a century for Gloucestershire in 2011 - that O'Brien prefers. "It's the best time to bat in Twenty20," he said. "You've got an opportunity to face the most balls." It is expected that O'Brien will be used in the middle order, with Graeme Smith, Jason Roy, Steven Davies and - once his IPL commitments are done - Kevin Pietersen at the top. It all promises no shortage of razzmatazz. Surrey's challenge to win this game is more mundane but, against a Gloucestershire attack who bowled them out for 132 in their first innings, no less challenging for that.